Grand Rapids, Michigan Has Great Boxed Water. Mikel, Shepp and I set out for a Milkshake trio show in Grand Rapids, Michigan a few weeks ago, to play a festival called Laughfest. I had never been to Grand Rapids or heard of the festival and I was pleasantly surprised. The Laughfest folks picked us up at the airport and took us to the Amway Grand Hotel in downtown Grand Rapids. It was indeed a grand hotel, originally built in 1929 and then bought and renovated by the Amway corporation in 1981. That accounted for the unique Amway bath products in the rooms – honestly, I didn’t know they still made shampoo and conditioner in one bottle anymore. But there it was, a true hair-product wonder. 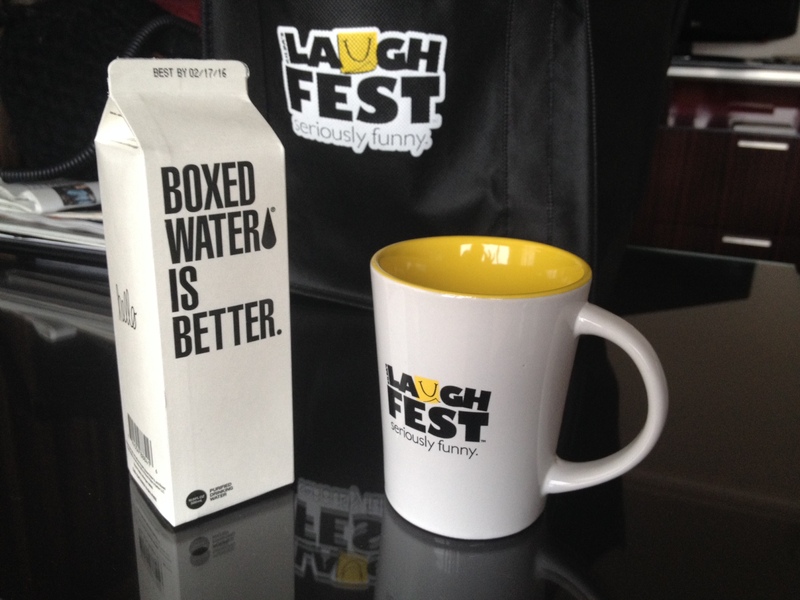 In each of our rooms we found a swag bag from Laughfest, complete with coffee mug, t-shirt, sunglasses and other things with the cheery yellow Laughfest logo – a bright smile. Also in this bag was the most remarkable invention: a carton of water with the writing “Boxed Water Is Better” on two sides. Duh…of course it is! And why isn’t this in every Starbucks across America? You put this empty boxed water carton in a landfill and it will eventually go away. An empty plastic water bottle remains with us forever. But the Boxed Water people don’t stop with a great concept. They also donate 10% of their profit to reforestation foundations and another 10% to world water relief foundations. I’d like to find a distributor in every state, starting with Maryland. Right now, only 16 states, Hong Kong, Canada and Mexico distribute Boxed Water. For more info, visit www.boxedwaterisbetter.com. The Laughfest people were all super-kind, and even drove Mikel to and from a ski resort during downtime. The festival was started in 2011 by Gilda’s Club Grand Rapids to raise funds and awareness of the emotional health found through laughter and community. Gilda Radner, who these clubs are named after, would be happy. It’s rare to find a festival – let alone a week-long one – that is so well-run for such a great cause. Photographer Dave Kagan took these pictures of the first show, with the exception of the last trio shot, taken by Brian Kelly for Laughfest. Shepp with his eternal smile. Signing cards after the show. Here’s a pic shot between shows by Laughfest photographer Brian Kelly. This entry was posted in Musings, Shows. Bookmark the permalink. Was just reliving last year’s LaughFest and came across your pictures. Grace had so much fun (we did too!). Thanks for coming and playing Grand Rapids! Oh, we had such a great time.I recommended our friends Recess Monkey for this year, but I do hope they have us back next year – such a great audience and wonderful city. BTW, love your blog!